« The Chipper Experience! – Where COMEDY & MAGIC Collide! 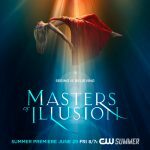 Chipper is proud to be appearing at one of the most unique venues in the U.S. when it comes to magic! It’s the ‘CHICAGO MAGIC LOUNGE’!,featuring high-end magical entertainment at its finest, in an incredibly cool setting! Guests can enjoy expert close-up magic at their cusomtized bar, fantastic sleight-of-hand in their parlour room, as well as top artists in their main showroom! 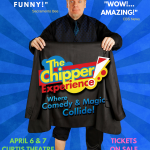 Chipper will be bringing his unique brand of fun and magic to the main theater for three nights only! August 10th, 11th, and 12th! For more details, please visit their website! Tickets now on sale. Seating is limited so book early!